Morning leave by surface for Shimla. It is 07 hrs drive from Delhi. Upon arrival in Shimla, Grand Tours India Representatives will greet and assist you to transfer to the hotel. Spend rest of the day at leisure. Dinner and overnight stay will be at hotel. Shimla : Also known as the Queen of Hills, Shimla is the capital of Himachal Pradesh. It is situated the north-west Himalayas. 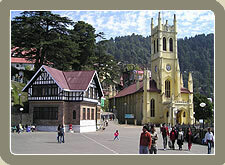 Before the independence Shimla was the summer capital of India. This beautiful hill station is called Shimla after the name of Shyamala, the goddess Kali. After hearty breakfast in the morning, enjoy full day local sightseeing tour including Kufri & Chel. Spend rest of the day at leisure. Dinner and overnight stay will be at hotel. Have a hearty morning breakfast at hotel and then drive to Manali visiting en route kullu Valley – the largest valley in the Kullu district in Himachal Pradesh. The valley is also known as the Valley of Gods. The Beas River runs through the middle of the valley. 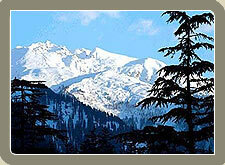 Upon arrival in Manali, Grand Tours India Representatives will assist you to transfer to the resort. Spend rest of the day at leisure. Dinner and overnight stay will be at resort. Manali : Situated along the banks of the river Beas, Manali is close to Rohtang Pass and Solang Valley. It is famous and popular hill station in Himachal Pradesh. After hearty breakfast in the morning, visit Rohtang by pass to see the India Pakistan border ( Army activity). Spend evening at leisure. Dinner and overnight stay will be at resort. After hearty morning breakfast at resort, enjoy the city sightseeing tour of Manali. Spend rest of the day at leisure in resorts. Dinner and overnight stay will be at resort. After leisurely breakfast at resort, drive to Dharmsala. Upon arrival in Dharmsala, Grand Tours India Representatives will assist you to transfer to hotel. Spend rest of the day at leisure. Dinner and overnight stay will be at hotel. After hearty breakfast at hotel, visit Dharmsala & Mclorganj. Spend rest of the day at leisure. Dinner and overnight stay will be at hotel. After hearty breakfast in the morning, drive to Amritsar. Upon arrival in Amritsar, Grand Tours India Representatives will assist you to transfer to the hotel. Later visit Golden temple. Dinner and overnight stay will be at hotel. --» Transportation by Non A/C Indica/Ambassador Car, with Driver, Toll, Permit & Parking Charges.